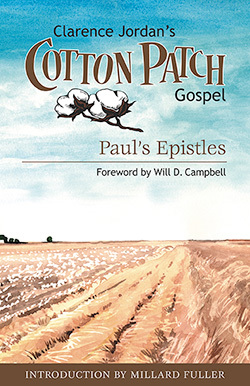 The Cotton Patch Gospel recasts the stories of Jesus and the letters of Paul and Peter into the language and culture of the mid-20th century South. Born out of the Civil Rights struggle, these now classic translations of much of the New Testament bring the far-away places of Scripture closer to home: Gainesville, Selma, Birmingham, Atlanta, Washington, D.C.
Born in 1912 in Talbotton, Georgia, Clarence Jordan, a New Testament Greek scholar, was the founder of Koinonia Farm, an interracial, Christian farming community near Americus, Georgia. During the civil rights era, Jordan and Koinonia Farm believed that the best way to effect change in society was by living in peaceful community with one another.